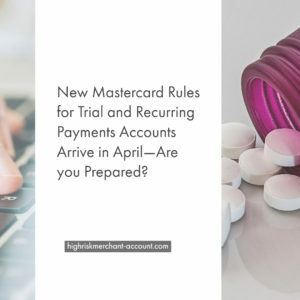 New Mastercard Rules for Trial and Recurring Payments Accounts Arrive in April—Are you Prepared? To establish transparency in the trial and recurring payments space, Mastercard is establishing new rules that focus on obtaining explicit consent from the customer. This is especially relevant for merchants in the nutraceuticals industry selling online. In a nutshell, by April you must send the customer an email verifying that they wish to continue with the initial purchase, and only the initial purchase after the trial period is over. April 12, 2019 is when the new rules will kick in and will have an impact on subscription, continuity, recurring billing and free trial models (Merchant Category Code 5968). This will affect card-not-present transactions when it comes to subscription-based models, usually on a monthly basis. Mastercard wants to protect consumers with transparency. It’s that simple. While Mastercard will classify all negative option billing merchants as high risk, and add additional responsibilities to them around protecting the customer, they are also adding more responsibility on acquiring banks..
Read on: Download the whole whitepaper here. What is Operation Choke Point? Posted April 22, 2015 | am I affected by operation choke point?, what is operation choke point? We’re A Top High Risk Processor Again! I’m a High Risk Merchant. How Do I Lower My Chargeback Ratio?